Thermometer Sudoku or Thermo Sudoku is one of very interesting Sudoku Variation. Thermo Sudoku puzzles are very much fun to solve and these puzzles requires some deep logical calculations. 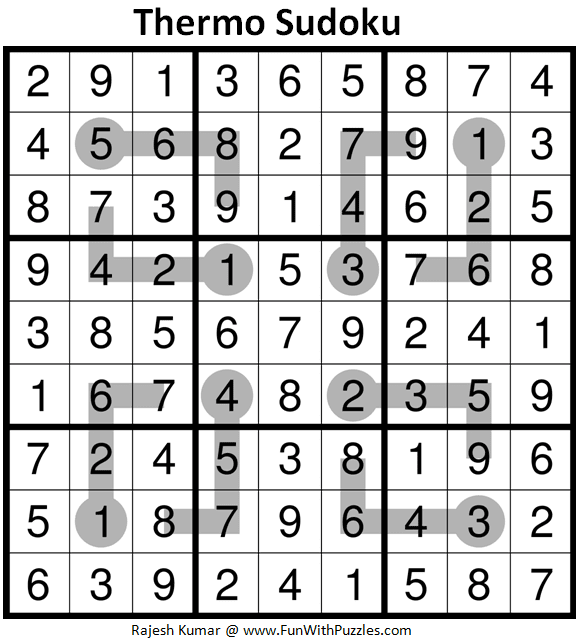 Moreover Thermo Sudoku can be designed to look visually appealing. I have been creating many Thermo Sudoku and Arrow Sudoku puzzles in last one year. Most of these puzzles are submitted for some of the forthcoming Sudoku books. 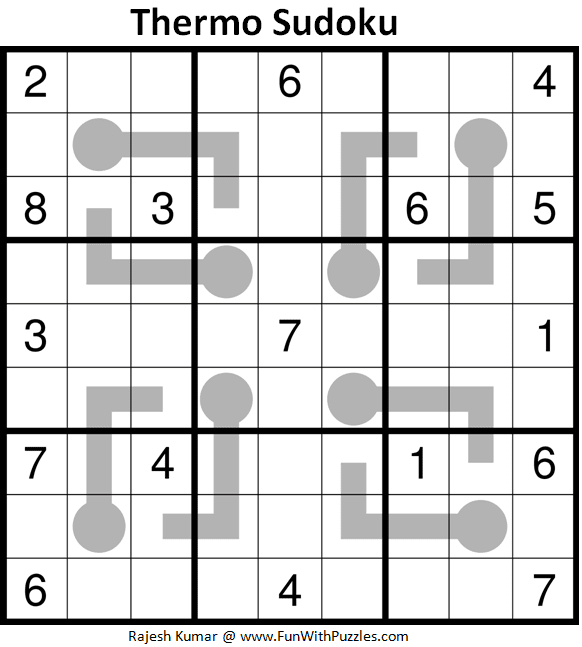 However there is great number of leftovers for these Sudoku puzzles which I will be slowly publishing on this website. Currently this Thermo Sudoku I am publishing as part of Fun With Sudoku Series as 331st Sudoku Puzzle in this Series. 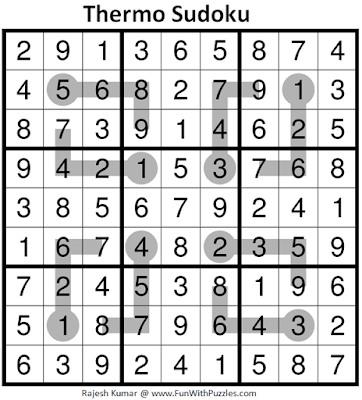 Theme of this Thermo Sudoku puzzle is Squares as there are four central squares in the Sudoku grid. This Thermo Sudoku, I will rate as tough which will requires some good logical deductions along with lots of pencil marks to solve this Thermo Sudoku. Answer of this Themro Sudoku #331 puzzle can be viewed by clicking on button. Please do give your best try to solve this Sudoku puzzle before looking at the answer. This Thermometer Sudoku Puzzles I am publishing as #331st Sudoku puzzle in Fun With Sudoku Series. Here are the next and previous Sudoku puzzles published in this series. Thanks for your feedback and comments. This is tough Thermo Sudoku and requires some of very narrow calculations. However this Thermo Sudoku completely logically solvable. 21:35.Had to use uniqueness twice to complete the sudoku .Very hard one. Yes, this was hard one. However I solved this Thermo Sudoku logically by fixing positions of 1 and 2 in central box.